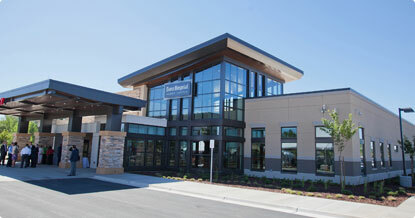 At Davis Hospital and Medical Center, our aim is to be the best acute care community hospital in northern Utah. In June 2013, in order to meet the needs of a growing community, we opened a brand new 16,000 square foot healthcare facility in Roy: The Weber Campus. We offer screening mammograms using advanced full-field digital imaging technology. With this technology, the entire mammogram process, from check-in to checkout, takes only a half hour on average. Now, these quick and comfortable screening mammograms are available in Roy, UT from the same team of technicians and radiologists who work at the main hospital campus. Same-day appointments are easy to schedule at the Weber Campus, and easy parking is available right outside the building. There’s no shuttle, no crowds, and no wait times. Women in Ogden, Roy, and other neighborhoods west of I-15 now have a high-tech, low-hassle option for screening mammograms. Call 801-807-7120 to schedule an advance or same-day appointment. The Weber Campus laboratory in Roy is a fully equipped 24/7 lab focused on quality testing and timely results, with clear and direct communication to physicians. The lab is accredited by the College of American Pathologists (CAP) and complies with all regulating and accrediting standards. All technologists are certified. At the Weber Campus, technologists have the resources to perform virtually all lab tests. Any test not routinely performed at the Weber Campus is transferred to the main Davis Hospital laboratory for completion. Call the Weber Campus lab services at 801-896-5636 for more information. Walk-ins and sample drop-offs are welcome 24/7. At the Weber Campus, registration services are focused on getting patients in as quickly as possible. Whether you’re dropping by for a screening mammogram or a walk-in lab test, you can expect a hassle-free experience with little to no wait time. Registration is just one component of our convenience-oriented healthcare. Patients in need of emergency care in Roy (and Layton) have the option of registering online with InQuicker, which further reduces wait time. The registration desk is open 24 hours a day, seven days a week, and is located just inside the building’s entrance. Please bring your insurance card and a photo ID. Call the Weber Campus at 801-896-5600 for more information about registration.